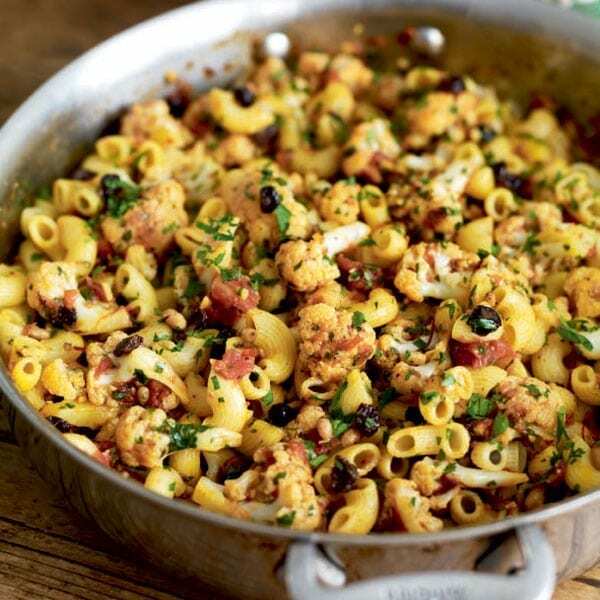 This cauliflower, currant and pine nut vegetarian pasta recipe is inspired by the exotic flavours of Sicily. Break the cauliflower into small florets and set aside. In a bowl, cover the currants with hot water and set aside. Put the saffron into another small bowl, cover with 4 tbsp hot water and leave to soak. Heat the oil in a large, deep frying pan over a medium heat, add the cauliflower florets and fry for 5 minutes, stirring every now and then, until they are beginning to soften but haven’t coloured. Sprinkle over the garlic and chilli, then cook for 1 minute more, stirring. Mix the tomato paste with 100ml warm water, stir into the cauliflower, cover, then cook gently for 10 minutes until the cauliflower is just tender. Meanwhile, bring a large pan of well-salted water (1 tsp per 600ml) to the boil. Add the pasta and cook for 7 minutes or until al dente. Drain the currants and add to the cauliflower with the saffron strands and water. Add the tomatoes, turn the heat up a little and cook for 3-4 minutes until the sauce thickens slightly. Season to taste, then stir in the pine nuts and parsley. When cooked, drain the pasta, add to the cauliflower sauce, toss together well and serve. I love this recipe because it creates something fabulous from a simple cauliflower. It also reminds of my year in Italy and the ways vegetables are used in pasta dishes in a way we don’t see here, even in restaurants.